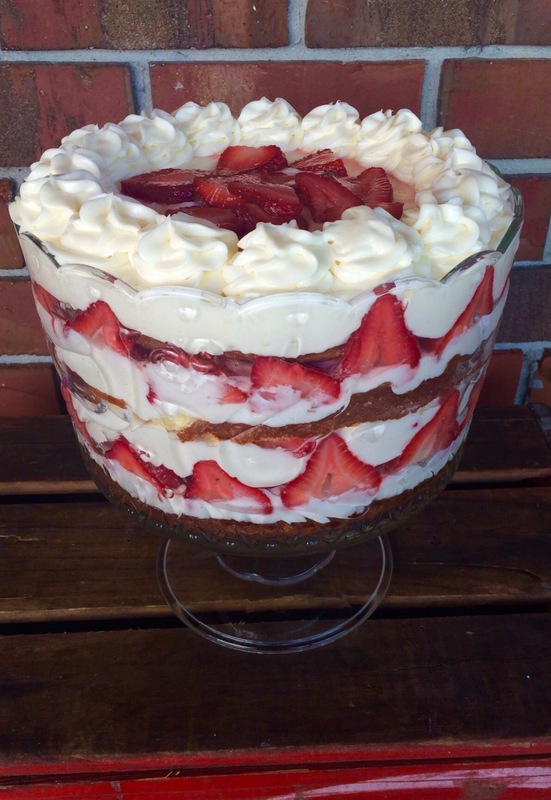 One of my Daddy’s favorite desserts is strawberry trifle. Whenever summer comes around he starts asking when I’m going to make one. So….. the warm weather is definitely here in the south. I thought… “why wait any longer”. This trifle is simple to put together and looks impressive, perfect for summer get togethers and picnics. 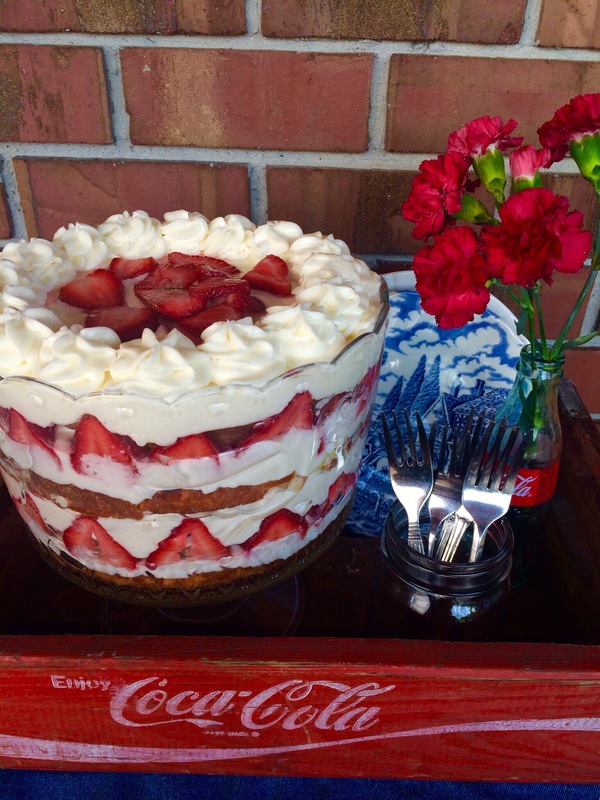 My friend Rachel enjoyed helping make this strawberry trifle and she decorated it too. I added lemon to this trifle because I love lemon and strawberry together,and it helps make this dessert light and refreshing. I use a cake mix to keep everything simple and easy. I did a few additional ingredients to the cake mix to replicate a pound cake. There are four elements to this dessert but each simple to put together. Don’t let the ingredient listscare you. Let me break down the layers of this trifle: cake layer, lemon syrup, cream cheese whipped cream, and sweetened fresh strawberries. 1)I suggest making this dessert the day before you plan to serve it. 2)Keep it chilled until ready to serve and store any leftovers in the fridge. Start first by preparing the cake: Preheat oven to 350 degrees F. Line two 8-inch cake pans with parchment paper and spray with non-stick cooking spray. In a large mixing bowl, cream together the butter and sugar together until light and fluffy, using a hand mixer. Add in eggs, vanilla and almond extract, water and sour cream, beat well. Beat in cake mix and flour. Pour batter into prepared cake pans. Bake in preheated oven for 25-30 minutes, or until a toothpick inserted into the center of the cake comes out clean. Let the cakes layers cool in the pans for about 10 minutes, then turn them out onto to wire rack to cool completely. Next the lemon syrup: In a small sauce pan combine sugar, lemon juice, and water. Bring to a simmer, simmer until sugar dissolves. Remove from heat and cool. Now prepare the cream cheese whipped cream: In the bowl of a stand mixer, beat cream cheese and sugar together with the whisk attachment. Remove and place in a separate bowl; set aside. Add heavy cream and vanilla to the stand mixer bowl and whip to soft pecks, using the same whisk attachment. Add cream cheese mixture to the whipped cream and whip together. Place in the fridge until you’re ready to assemble. Lastly the strawberries : Combine the strawberries and sugar together in a medium-sized bowl, let them sit for about 30 minutes. Finally it’s time to assemble: Slice each cake layer so you have four cake layers all together. Place one cake layer in the bottom of your trifle dish. Drizzle the cake with the lemon syrup. Next spread cream cheese whipped cream on top, then layer on the strawberries. Continue building the trifle in this way ending with cream cheese whipped cream. Garnish with additional strawberries.